“No one can deny the fact that Islam is very much in the spotlight today,” said Sheikh Faruq Post, Imam of the Islamic Society of Western Maryland. 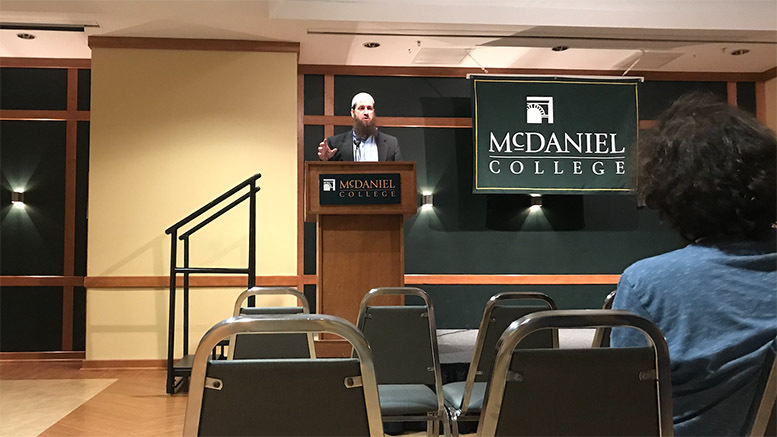 On Tuesday, Oct. 24, the Office of Student Diversity and Inclusion (OSDI) along with the Office of Residence Life hosted “A Discussion on Islam: Fact vs. Fiction” in the Decker Forum. Post, a resident of Hagerstown, Md., was invited to speak about Islam as a whole, as well as to address negative myths of its followers. Post put forth his truths as a follower of Islam. A recurring point of his talk was that all Muslims must maintain a standard of peace and humbleness, and exercise daily their absolute submission to Allah. He continued with a basic definition of a Muslim: someone who submits to his Creator. Post stated that a Muslim’s religion encompasses all aspects of life. A Muslim’s “religion is what motivates him to stand for the truth; to speak out against oppression, injustice, transgression, and evil deeds and evil acts,” said Post. He explained that his religion is one of peace and equality. “Islam is life, Islam is freedom, Islam is liberation, Islam is peace — inner peace, outer peace — and Islam is sacrifice,” Post exclaimed, describing his faith as a way of life. With the authority of an official scholar of Islam, Post not only spoke about moving beyond the negative perceptions of Islam in American society, but also relayed that followers of Islam are just regular people with a fierce love for their god. He added that Muslims are all over the globe, and not just the Middle East, which is what we often see in the media. Post also addressed the stereotype that women are oppressed in Islam. He asserted that any Muslim men who oppress women do not follow true Muslim teachings. Post stated that it is a cultural idea, rather than one of Islam, that causes the oppression of women, citing mistreatment of women in Ancient Rome and Persia. Post asserted that Islam offers women a haven for intellectual ability and thought. He said that Islam honors women and treats them as individuals instead of property. “Islam uplifted women. It gave them honor and equal status in the sight of God,” said Post. He included that Islam gives women the rights to education and work. Post also spoke about his Catholic upbringing and said that it was his study of the Bible that led him to convert to Islam when he was 25 years old. Post closed his talk by urging McDaniel students to always search for knowledge and never stop looking for the truth in all things. “The readers of today are the leaders of tomorrow,” Post said.